Lisa Jackson's fan club had a reunion last night. The Obama-era EPA administrator returned to Washington, where she was surrounded by her former team and celebrated for her work at the agency, even as some of her efforts are being rolled back by the Trump administration. Trump EPA officials were at the swanky hotel dinner, too, where Jackson — now an executive at Apple Inc. — steered clear of criticizing the administration. Jackson, who led EPA from 2009 until early 2013, was given an environmental achievement award by the nonpartisan Environmental Law Institute. Her former staffers — some of whom have moved away from Washington — returned for the event. Former Attorney General Eric Holder introduced Jackson, touting regulations issued under her watch to curb greenhouse gas emissions from cars and trucks and limit mercury pollution from power plants. The Trump EPA has moved to scale back the latest iteration of Obama-era greenhouse gas limits for cars and trucks, and the agency is attempting to redo the underlying justification for the power plant mercury rule. Other EPA leaders have publicly criticized the Trump administration's rollbacks, but Jackson has been cautious in her public statements. During a 25-minute interview last night, she discussed her career at EPA and at Apple, but didn't mention Trump EPA boss Scott Pruitt or now-acting EPA Administrator Andrew Wheeler. Jackson did refer to President Trump once, when she was asked about Apple's commitment to help meet the goals set in the Paris climate accord, despite Trump's decision to withdraw. "Apple has been clear that we remain committed to fighting climate change," she said. Apple CEO Tim Cook "personally lobbied the president to stay in the Paris Agreement. That didn't work," she said. "We made it very clear that that's not going to stop us." 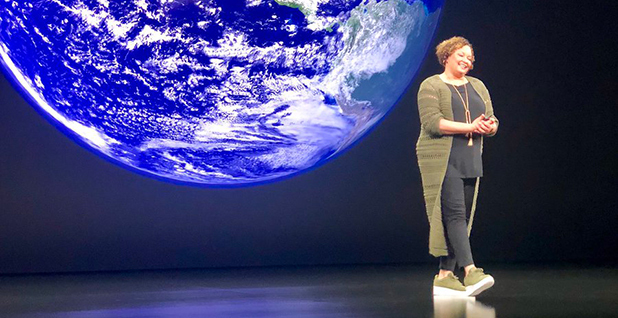 Jackson touted the power of the private sector to move supply chains and to advance environmental protection, and she heralded the "relentless optimism" among staffers at Apple, many of whom are millennials. "They're not all millennials," she said. "I'm there." Among the Obama EPA staffers at the ceremony were Bob Perciasepe, Jackson's former deputy administrator; Scott Fulton, ELI's president and a former EPA general counsel; Lisa Heinzerling, former policy chief at the agency; and Arvin Ganesan, who led EPA's congressional affairs shop and now works with Jackson at Apple. Members of her former press EPA team were also on hand, including Seth Oster, Allyn Brooks-LaSure, Adora Andy Jenkins, Brendan Gilfillan and Alisha Johnson. Trump administration officials at last night's event included EPA General Counsel Matt Leopold, Deputy General Counsel Justin Schwab and the Council on Environmental Quality chief of staff Mary Neumayr. It was the second time in the past week that Obama and Trump EPA officials have mingled at such events. Last week, some of the same EPA alumni gathered at headquarters for a formal unveiling of a portrait of Gina McCarthy, Jackson's successor at the agency.